Thirty-Six District In The Punjab Province And Jhang Is One Of Them. Is The Middle Point Of The Traffic Flow Form Karachi To Peshwar Or Other Cities.Before 2019 The Heavy Traffic Passes Through It.Jhang Is Very Old City With Differents Cultures With It.There Are many Famous Personalities Belongs To Jhang Sadar In Which Doctor Adbul Salam Belongs To Jhang And Famous Cricket Empire Aleem Dar Belongs To Jhang And Many Other Personalities Also Belongs To The Jhang Sadar. Heavy Traffic Like Long Vehicle Truck And Buses Passes Through The Ayub Chowk Jhang For Their Destination Like Islamabad Or Sargodha Or Chiniot Or Other Related Cities. This Is One Of The Most Famous Chowk Of The Pakistan Where May Be Daily 10000 People Passes From It Because Its Connected To 5 Roads That’s Going Towards Other Cities Of Punjab. But Unfortunately There Is No Traffic Signals In This Most Famous And Most Busy Chowk. Above you Can See The Image Of This Famous Place. Click Below Link To See More Beautiful Images Of Jhang City Of The Punjab.Click This Link To See More Images Of Jhang. In The Election Of 2018 Of Pakistan In Jhang City PTI Win Almost All The Seats In Province And National Assembly. PTI Successfully Made His Govt In Punjab And Kpk And In National Assembly In 2018.After Some Moths This Govt Start Operation Against The Illegal Land Mafia In All Over Pakistan So Many Places Clear By The Govt Of Pakistan So Many Places Clear In Jhang District Also.In Which Many Shops Area Clear In Different Area In Sargodha Road, Bhakkr Road, Faisalabad Road, Toba Road And Yousef Shah Road. Due To Heavy Traffic Load In Jhang City Areas In 2019 Jhang Govt Decide To Ban The Heavy Traffic Buses, Trucks Or Heavy Loader Passes Through the Ayub Chowk Jhang . And All Traffic Divert From The Main Bypasses Of The City. 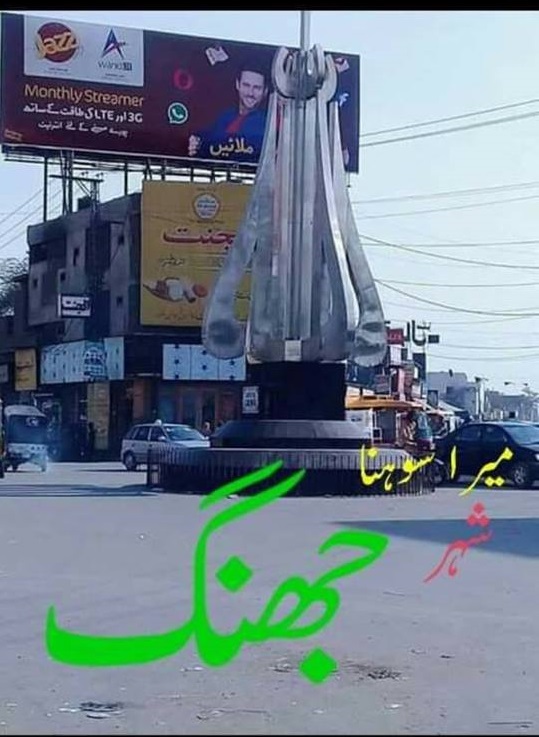 Till 2018 All Buses terminals Are In This Chowk But In 2019 All The Busues Terminal Shifted To Lari Ada Of Jhang Sadar So Now All Buses Service Available In Lari Ada.Its Great For People Living In This Area Because Before That Daily Accidents Occurs In City Area Of The Jhang.